Conjunctivitis is a condition that affect the eyes. It is often referred to as pink eye due to the red coloration that usually appears in the eyes.. You might notice that your eyes and eyelids are red and irritated or notice thick discharge from your tear ducts. Other symptoms include a blurred vision, itchy eyes and an excessive amount of tears. Wearing contact lenses and being exposed to allergens or irritants can cause this condition to appear, but it is sometimes caused by exposure to a virus or to a bacteria. A bacteria could be the reason behind this condition. However, his health problem can be caused by the same virus that causes the common cold. Being exposed to irritants or allergens can also cause this condition to appear. You should have a doctor look at your eyes to determine what could be the cause of this health issue. You definitely need to see a doctor if you suffer from chronic pink eye. If your doctor determines that your conjunctivitis was caused by a bacteria, they will prescribe some antibiotics. If a virus caused this problem, your pink eye should go away by itself but you need to adopt an excellent hygiene since it could be contagious. If allergens or irritants are responsible, your eyes should clear up by themselves once you are no longer exposed to the allergen or irritant that caused the problem. How can you deal with the symptoms? Pink eye is usually not a serious health problem, but the symptoms can be bothersome. You might suffer from itchiness, pain or discomfort and be unable to perform some basic tasks such as working or driving. Some individuals also experience an increased sensitivity to light. Your doctor might prescribe some drops to help with the itchiness. Most patients simply have to live with the symptoms until the problem goes away by itself or until the antibiotics treat the infection. Can acupuncture be used to treat conjunctivitis? Acupuncture is sometimes used to soothe the symptoms associated with pink eye. A patient who suffers from pain and discomfort will experience relief after an acupuncture session. Acupuncture will not treat the problem at its root since it cannot cure an infection but it can definitely help with some symptoms. Can pink eye be a chronic problem? Some individuals suffer from chronic conjunctivitis. This can be caused by repeated exposure to allergens or irritants but some individuals get chronic pink eye for no apparent reasons. The most likely cause behind this recurring health issue is a weakened immune system. A lot of people who suffer from chronic pink eye usually suffer from this condition during a specific season due to increasing exposure to viruses or allergens. Acupuncture will not treat the pink eye itself but can help strengthen the immune system. A patient who suffers from chronic pink eye due to allergic reactions or due to a weakened immune system will definitely benefit from acupuncture treatments. It might take a while before they see any results, but acupuncture treatments could make this chronic problem disappear. If this is the first time you experience pink eye, you need to schedule an appointment with your doctor to figure out what could cause this problem. 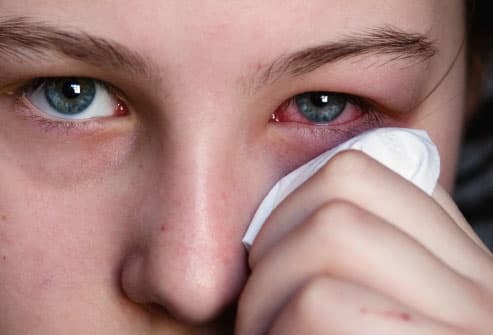 If your conjunctivitis is the result of an infection, a virus or a bacteria, you might be able to get rid of this health condition with medication. However, you should consider acupuncture if your pink eye becomes a chronic problem or if the symptoms are difficult to live with.